Offering you a complete choice of products which include motor test bench, electric motor testing panel and motor performance testing panel. 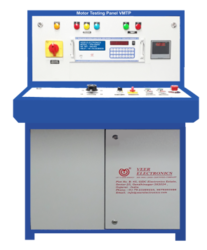 We are engaged in offering a wide range of Motor Test Bench to our valued customer. These panels are available in various specifications in order to attain maximum clients satisfaction across the world. Offered range and designed and developed using best quality raw material and technology. We are engaged in offering a wide range of Electric Motor Testing Panel to our valued customer. These panels are available in various specifications in order to attain maximum clients satisfaction across the world. Offered range and designed and developed using best quality raw material and technology. Leveraging on our experience, we are engaged in offering a wide range of Motor Performance Testing Panel with Computer Interface. Offered range is manufactured in compliance with international quality standards, this control panel is manufactured using high quality components.We have exported our Instruments to More Than 32 Countries like USA, Colombia, UK, Belarus, Czech Republic, Germany, Italy, Poland, Romania, Spain, Switzerland, Turkey, Congo, Ghana, Saudi Arabia, Morocco, Zimbabwe, Bangladesh, Iran, Nepal, Pakistan, South Korea, China, Malta, etc.